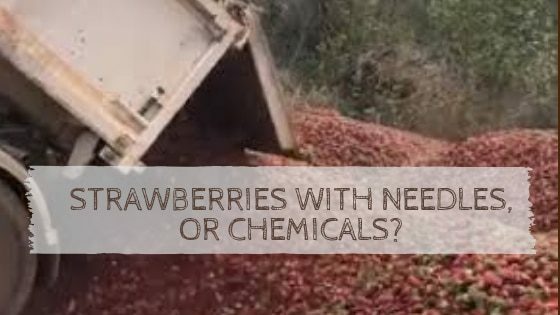 Strawberries with Needles, or Chemicals? I don’t mean to kick a strawberry farmer when he’s down, but the needle scandal makes me wonder…what if all the chemicals used to grow Australian strawberries were as obvious as needles? Now is the time to eat strawberries – conventional or organic – so they don’t go to waste & the farmers can stay in business, but I just have to raise the point..most of our strawberries have always been contaminated…just in a less spiky-scary way. There are loads of harmful things hidden in the food we eat. Aside from the current scandal, what about the things we can’t see, feel or taste? At least you can tell if there’s a needle in something, not so easy to detect & avoid a chemical residue. I love strawberries, I buy organic when they are in season / I can afford them / I find a bargain, though sometimes I just buy the cheap, chemically grown variety & I don’t feel really great about eating them or feeding them to the kids. Not meaning to bag strawberries – I just want to raise a point now with all the needle noise, what about the chemicals that are already contaminating Aussie strawberries? How long will we just accept these for our kids? A quick rinse under the tap does not make a chemical-free berry! Strawberries are right at the top of the dirty dozen list – produce with the highest levels of chemical residue. They are difficult / expensive to grow organically, hence they will cost more when grown naturally / properly. Needles may turn out to be the least of our worries! I think a lot of people who are used to cheap food become really desensitised to the wastage factor “who cares if the kids don’t eat the whole pile of mac & cheese we just served up for dinner, the packet only cost us $3.50 & all we had to do was shove it in the microwave with some water. If they won’t eat it, just scrape it into the bin & who cares”. ARRGHHH!! Not enough care factor goes into food manufacturing, shopping, prepping…not enough money is invested in quality food & as a result food is just not valued the way it should be…& the kid’s growing bodies are also undervalued. If you put a lot of thought into feeding the family well, pay good money for quality fresh produce that’s been grown naturally, & spend time in the kitchen preparing it, you’re not gonna be happy to see it wasted & your kids won’t grow up thinking it’s ok to just chuck food out. Our great-grandparents would roll in their graves if they knew how many kgs’s of strawberries were being dumped because some loony-tune has stuck needles into a few punnets & everyone is freaking out. Wasting them is craziness, everyone needs to just chill out & chop them up! Most of the strawberries (& other fruit & veg) grown in Australia ARE contaminated, with chemical residues we can’t detect. This is a bigger issue than needles! Consumers are conditioned by supermarkets & food / agricultural giants to think that food should be dirt cheap & last for months / years on a shelf. I’m all for saving money & finding a bargain, but I also appreciate (& will pay for) food that has been grown or made naturally, without the use of chemicals. I wish that was the case across the board, so I try to do my bit & support organic growers & smaller manufacturers whenever possible – that is the only way to get to a chemical-free future, if we support organic farmers & artisan food producers. If there were no $2 punnets of strawberries (or $3.50 mac & cheese packets), you’d just pay what it really should cost for them, the real cost of real food. Strawberries are a difficult & fragile thing to grow, chemicals are the cheapest & easiest way to increase yield / profit / decrease labour costs…but what is the cost to our health when we accept this type of food production? Organic & artisan produced food is more expensive, yes – but you’ve got to ask yourself…would you rather cheap, industrial, mass-produced, contaminated food to feed your family, or try to get the uncontaminated wherever you can, if at a higher price? We all need to do our bit here – let’s get the strawberry farmers through this crisis (just buy them regardless), but let them know that in future, we’d prefer organically grown. 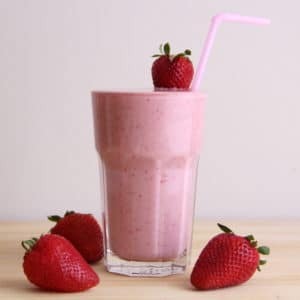 Try this tasty Strawberry Smoothie recipe! This entry was posted in General Health, Healthy diet and tagged chemical residue, contaminated, needles, organic, strawberries.